Singapore is worldwide famous for the food, the futuristic architecture and for being a multicultural state. Now Singapore is the home of the Asian’s largest night race, the Sundown Marathon Singapore with over 27.500 runners from 55 countries. We joined 2016 edition and enjoyed every km! The entry process is straightforward, on the official website of the event you will find all the info on how to enroll for the race. I did Natalie’s and mine in less than 10 minutes. 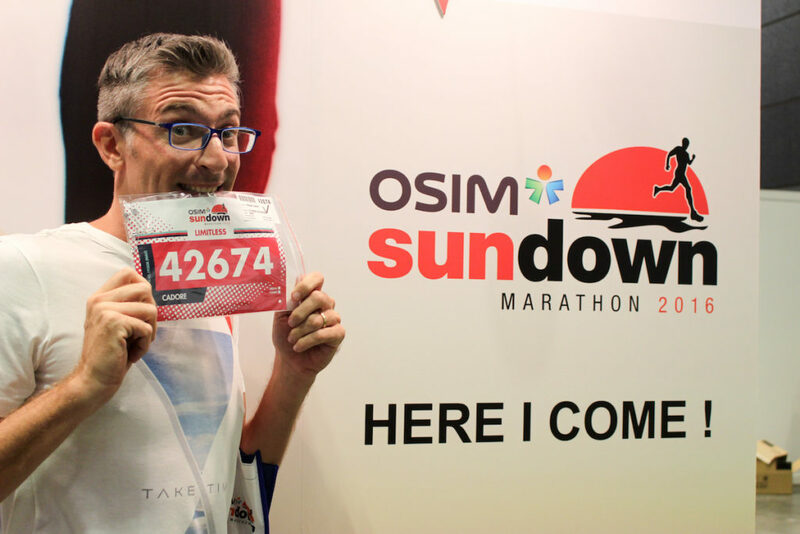 The Sundown Marathon Expo took place at Suntec City, a huge convention centre & shopping mall. You should collect your race pack during the expo, so we went there on the second day, found it well organized and with helpful staff. Got our race packs really quick. In total, we spent about 45 minutes in the Expo. There are several booths from renowned brands showing their latest products like Garmin, TomTom (their new watch is incredible), Compressport… Also got to know about other races in Asia and even raced my fastest triathlon ever, 1 minute and 56 seconds. There was one issue though, the Expo happens one week before the race. Many oversea runners were not able to visit the Expo and have to collect the race kit on the race day. Tip: Better to reach Suntec via MRT, from Esplanade or Promenade stop is about 3 minutes walking. The course of the Singapore Marathon is great. I would say 98% flat, there is one bridge on the beginning of the race that is quite steep and another one on the end of the race that is a killer. In general, the course is very pleasant, the race starts on the F1 pits, you cross all the extension of East Coast Park then back to Gardens by the Bay East, over the Marina Barrage, pass by Gardens by the Bay and head to the Singapore Flyer. The views from the Gardens East and the Marina Barrage are incredible. Here you can check the map. The action started at 6pm, on the area around the F1Pit Building. There was plenty of activities for runners and non-runners: movie screening, basketball, dodgeball, zumba… We arrive late, around 11pm so didn’t get to see much of the other attractions. The heat was tough even racing during night time. Running along the East Coast Park was better, we got a sea breeze that helped to cool down a bit. The volunteers did a great job cheering and boosting the runners confidence. They could be found on every 3km or so. The vibe among the runners was awesome, people were very excited and we didn’t feel that heavy competitive atmosphere. We really enjoyed the race. A few things that we didn’t like, the race starts late at night, flag off for the half marathon was at 11:45am and for the marathon at 12:30am. It is really crowded on the first 10 km, it’s hard to maintain a consistent pace (an issue on every race with over 5 thousand runners). The first 3 aid stations were a bit crowded too, on the other ones was easier to get isotonic, water, gel, banana… I wish they have ice on the stations, a bag of ice would be great to cool down! It was Natalie’s first half marathon and my 5th marathon (counting the ones I did on my Ironmans). She finished the race in 2:19h and I did in 4:43h. Where to stay in Singapore for Sundown Marathon? It all depends on how much you want to spend. You can stay right in the city centre close to the race, or a bit further and rely on taxis or public transport. Singapore’s public transport is one of the best in the world, buses and metro works perfectly. Travelling to Singapore Sundown Marathon? Plenty of airlines offer flights to Singapore Changi Airport. Suggest to check on Skyscanner or Expedia for the best deals. To reach the city centre from Singapore airport is easy, board a taxi or take the MRT (metro). If you are coming from Malaysia, travelling by bus is another option. How is the weather in Singapore for Sundown Marathon? Be sure that it will be hot. Singapore weather is warm all year around. We were wishing for some rain to refresh a bit, but it didn’t happen. On May, the temperature in Singapore does not go below 26-28C. Heavy showers can occur but it’s hard to predict. It may rain for 5 minutes or the whole day. Overall Hivelocity, Sundown Marathon organizer, did a great job. We enjoyed the race, the expo and the entry process was easy. Their website and Social Media channels were updated and most of the information needed pre-race could be found online. Of course, there is always room to improve, I would suggest to organize the Expo on the same weekend as the race and to start the race earlier. So here you go, all the info and tips to organize yourself to run the Sundown Marathon 2017. It’s a well organized and fun race. Maybe see you there next year! PS: A big thanks to Hivelocity for inviting us to this race. I must admit I only do a lot of walking on the treadmill. But this sounds interesting, especially in Singapore. Night things are so safe there. Nice job–congrats to both of you for finishing your races! Such a great accomplishment!! 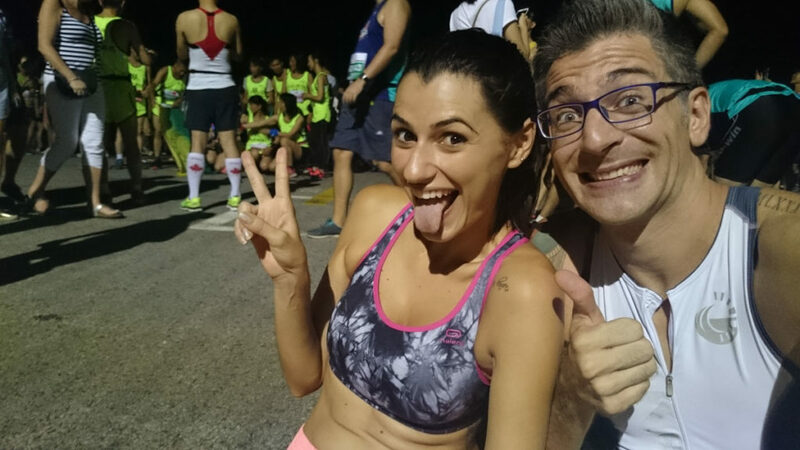 I really like the concept of a night marathon–it makes for a different atmosphere and it would be nice to have it a bit cooler out as well! Sounds like a great experience and a fun time! I joined their marathon last year with some of my colleagues, the race does really start late! There were a lot of entertainment programs going around and I was thinking, maybe they forgot about the race? hahaha but the organizers sure did a great job! Yep, the organizers did a great job! Congratulations to the both of you for running the half and full marathons. Sounds like an amazing experience. I’ve run 8 marathons, but never one at night. Did that throw you off a lot, given that you were probably training during the day? We’ll be in Asia next and perhaps we will see you at the 2017 marathon. Cheers! 8 marathons? Wow! well done! Yes, you feel a bit weird after 2am. We did some runs at night time but never that late. What an amazing experience! I struggle to run due to shin splints but props to you guys for being in awesome shape to do a half and full marathon each whilst traveling! Natalie must have had an incredible feeling of accomplishment when she crossed the finish line on her first race! Thank you Vicky! It was a great feeling indeed! 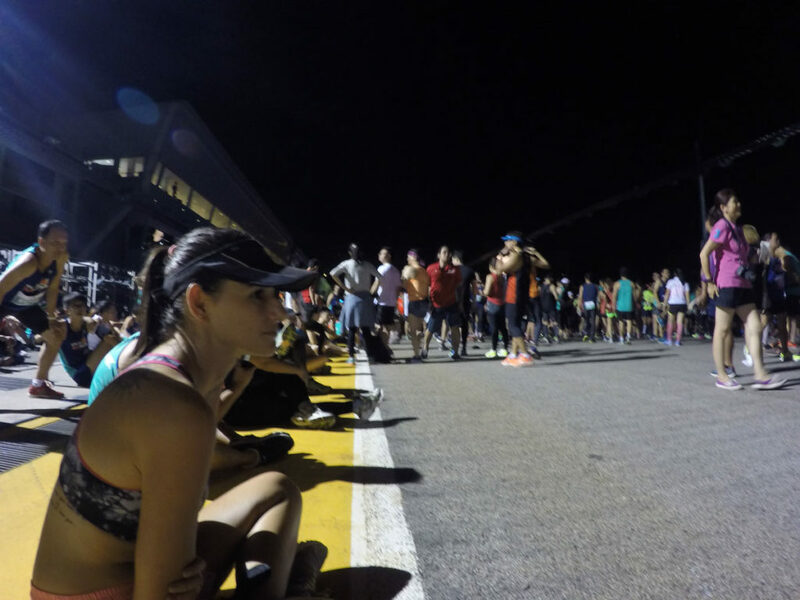 The good thing about a night race is that you’d beat the heat. 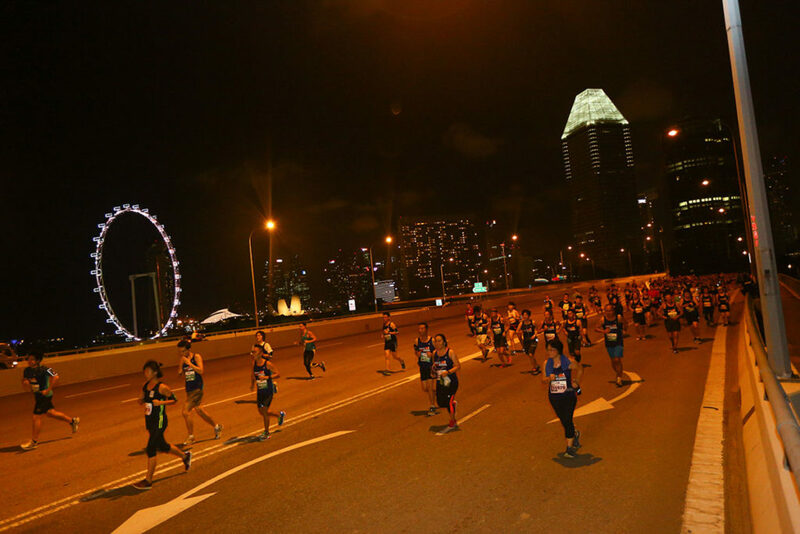 I’d never even heard of night marathons – the Sundown Marathon Singapore sounds so fabulous, though definitely beyond me. Well done! The Sundown Marathon was a big surprise for us too We have run at night time before, but the start was always around 7-9 pm. In Singapore, apart from the heat, the challenge was to be awake to almost midnight, when was the flag off. But worth it, we had an amazing experience! Congratulations! Singapore is very pretty at night with all the city lights. Unfortunately the weather stays warm, but its much better than running in the afternoon heat! Singapore by night is stunning. The view we had from the Marina barrage with the city all lighted up, was gorgeous. It was tiring but worth it, the marathon was a great experience! Great job! Thank goodness it was at night, I couldn’t imagine running under the hot sun. Such a late start though! I agree it would make a lot more sense to have the expo closer to the race, it seems like it would be much more convenient for all the international racers. You are right, I can’t imagine myself running in Singapore during the day. It’s so hot and humidy. Cheers and good luck on the race! Seem like a fun event! I wonder if there will be another event like this coming August? Planning to travel to Singapore on that date. Anyhow, your post is much appreciated. 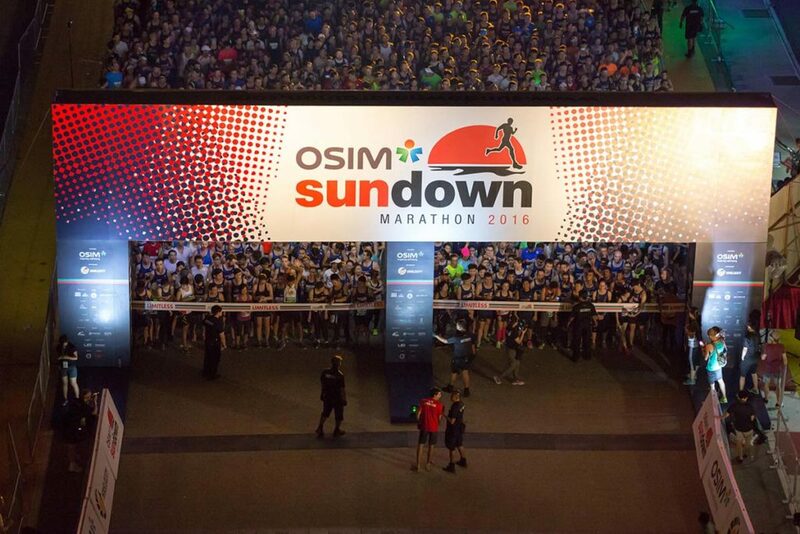 The Sundown Marathon happens every year and it’s a really nice event to join. Happy travels and enjoy Singapore.